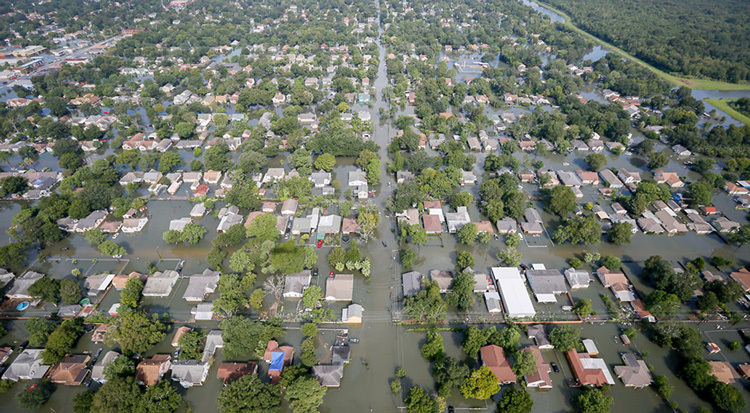 Houston — The Nature Conservancy announced new findings from a study produced with Texas A&M University that analyzes flood loss claims and estimates from over 74,000 properties impacted by Hurricane Harvey in Houston’s Harris County. The study finds that a strategic land buyout approach that prioritizes the purchase of land parcels in “clusters,” as well as proximity to existing open space, is just as cost-effective as the traditional, piecemeal approach but with major added ecological and social benefits. In 2017, Hurricane Harvey dropped 34 trillion gallons of rain over the Gulf Coast, destroying or damaging over 200,000 homes and causing $125 billion in damages. For areas that suffer from repeated flooding, voluntary property buyout programs are often a cost-effective approach to flood-risk reduction that offer property owners the opportunity to sell impacted homes at a fair market value. The report (https://www.nature.org/content/dam/tnc/nature/en/documents/harveybuyoutsummary.pdf) finds that this traditional buyout method is often implemented in an uncoordinated and reactionary ‘checkerboard’ pattern — after flooding has already done its damage. While well-intentioned, these buyout programs are often less effective at improving flood resilience in their execution. The report also shows that the more proactive ‘clustered’ buyout approach can bolster communities and increase flood resiliency by repurposing newly vacant ‘clustered’ lots as natural spaces. These natural spaces can then be utilized to restore functions of floodplains, absorb and clean storm water, provide space for outdoor recreation, and improve the visual character of urban areas – all while remaining just as cost-effective as the traditional model. “Clustered buyouts provide an opportunity to merge several parcels into one and put the resulting parcel to work as green infrastructure for soaking up and storing stormwater,” said Dr. Christine Shepard, director of science for The Nature Conservancy in the Gulf of Mexico. In Harris County, there are hundreds of thousands of homes on the list for voluntary buyouts, but there is not adequate funding or capacity to meet that need. Areas like this have flooded before and are continually at risk of flooding again. Nature-based solutions like this new approach to ‘clustered’ land buyouts can provide vital protection needed to reduce the impacts of storm damage. Recent polling in areas affected by Harvey indicates that more than 80 percent favor directing federal recovery dollars to natural infrastructure to reduce risk from future storms and increase resiliency. The study offers a roadmap for municipalities, land trusts, and other community leaders for buyout programs that stack multiple benefits like flood-risk reduction, open space protection, and enhanced resilience — all while increasing safety and conserving funds. The study was done through a partnership between the Texas Chapter of The Nature Conservancy, the Conservancy’s Gulf of Mexico Program, and Texas A&M University and was funded with a Grant from the Walton Family Foundation.